Use the price chart below to estimate the cost of your repair and return shipping. Complete and print our online repair form. Pack your shoes and the printed repair form into a shoe box, Priority Mail bag, or similar, and mail them to us. 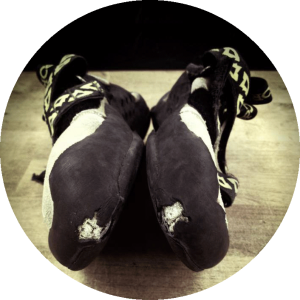 The construction of a climbing shoe is such that the rand is applied to the body of the shoe. The rand is prepped for glue and the sole is applied to the underside of the ran d. To repair the rand we need to remove the sole, repair the rand and then resole the shoe.